In its accredited test center in Würzburg, Brose test engineers check the electromagnetic compatibility (EMC) of up to 100 products of its door systems, seat systems and drives business divisions each year. The test results are incorporated early on in the product development and design. The Brose Group has invested one million euros in a state-of-the-art test center in Würzburg to measure electromagnetic compatibility (EMC). The facility has been recently accredited and now meets all international standards. control (electronic stability program). "A modern medium-size vehicle contains almost 40 electric motors," explains Thomas Schindler, Vice President Electronics Brose Group. "We already begin testing in the early development phase of the product whether these motors interfere with each other or with other vehicle functions." The mechatronic specialists working in the electric motor expertise center in Würzburg have the know-how and technical equipment required for this task: Jürgen Neidhardt, Manager Electromagnetic Compatibility Electronics Brose Group, and two engineers test more than 100 products each year in terms of their electromagnetic compatibility. 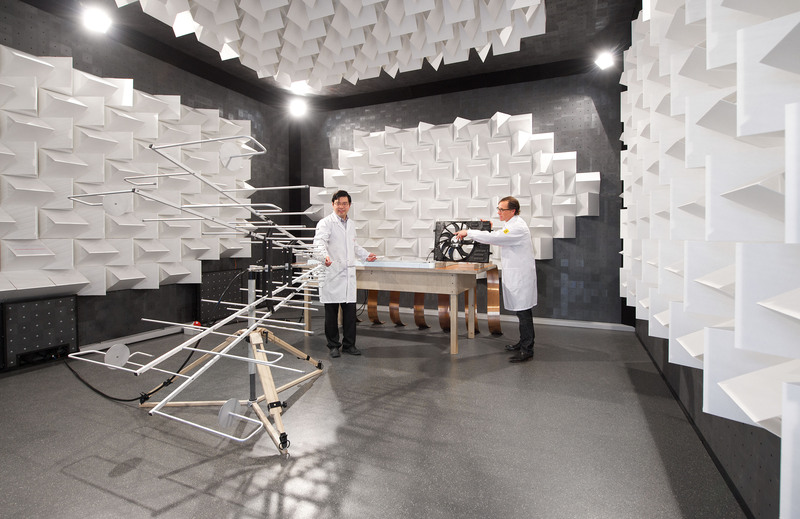 The centerpiece of the 120 square meter test center is its anechoic chamber equipped with metal shielding. The specialists test vehicle components using extremely high field levels of up to 200 voltmeters and a transmitting power of 1000 watts on a high-performance antenna. A mobile phone, for example, must not exceed 60 volts per meter and has a maximum transmitting power of two watts. The receiver, signal generator and computer to control the measuring equipment are located in front of the chamber. The EMC center also has a test bench for electrostatic discharging and a room to test electrical impulses for electronics such as cooling fan modules or door control units. The measured results enable Brose to ensure EMC-compliant design as early as the development phase of a product. In addition, the measurements also provide information on the components' interference emission and immunity. The facility was officially accredited according to DIN EN ISO/IEC 17025 in the first half of 2014. Two auditors from Germany's National Accreditation Body DAkks assessed the EMC center in Würzburg and confirmed to Brose that it meets all requirements in terms of technical and organizational expertise. The assessment was performed independently and all results are transparent and traceable. The test center is used worldwide by design engineers from the door and seat systems and drives business divisions. "It is no longer necessary to outsource measurements to external EMC laboratories," explains Schindler. "In addition to being much quicker and more independent, we can also save costs. Our test center fully complies with all standards required of such a laboratory."